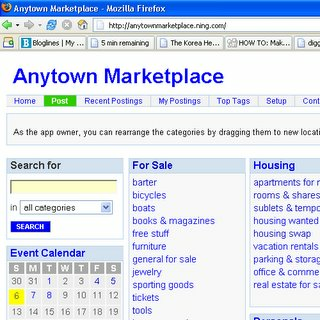 For the past couple of weeks I have been working on this (Ning) webapp called Anytown Marketplace. It's a Craigslist-like app that you can clone and customize for your city if it doesn't yet have Craigslist. It was recently featured on the Ning Blog. If you click View Source you'll see that the PHP code is really clean -- this is because I've laid out the files like a Ruby on Rails app. posted by Jonathan at 11/06/2005 02:35:00 p.m.
By Fin, at 11/06/2005 3:09 p.m. Thanks Fin. And greetings from Victoria BC to Bristol! By Jonathan, at 11/06/2005 3:11 p.m.
Wow, Jon. You continue to impress. By chris sivori, at 11/09/2005 8:03 a.m. Thanks Chris! I gotta credit my colleagues - May Woo for the user interface, and Nancy Chacko for the detailed QA. By Jonathan, at 11/09/2005 10:30 a.m.
By nec, at 11/16/2005 8:29 p.m.
By Jonathan, at 11/17/2005 12:05 a.m.
that's very hot! and you seem to have included a lot of the right elements to make it really useful. keep up the good work! By jose nazario, at 11/19/2005 12:10 p.m. Thanks Jose! I've just released a version with Google Maps. Clone away! By Jonathan, at 11/22/2005 11:28 p.m.
Nice article. Craigslist is fantastic service. I have found another grat article about this site.. happy reading. By Anonymous, at 2/24/2007 4:53 p.m.